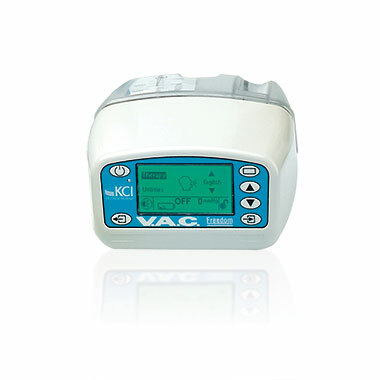 Designed to help patients receiving the proven wound healing benefits of V.A.C.® Therapy be mobile for longer periods of time while being cared for in the skilled nursing or long term care settings. 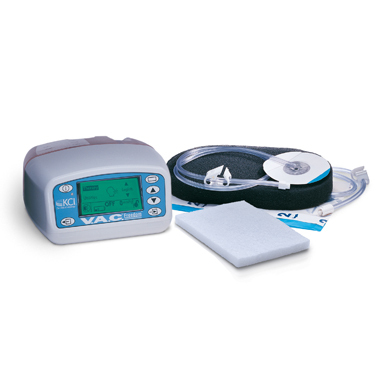 The integrated V.A.C.® Therapy System has a unique mechanism of action whereby the delivery of negative pressure through the V.A.C.® Therapy units using proprietary V.A.C.® GRANUFOAM™ Dressings, maintains a wound environment that promotes healing. The V.A.C. FREEDOM™ Therapy System is an integrated wound management system for use in acute, extended and home care settings. It is intended to create an environment that promotes wound healing by secondary or tertiary (delayed primary) intention by preparing the wound bed for closure, reducing edema, promoting granulation tissue formation and perfusion, and by removing exudate and infectious material. It is indicated for patients with chronic, acute, traumatic, subacute and dehisced wounds, partial-thickness burns, ulcers (such as diabetic, venous insufficiency or pressure), flaps and grafts. V.A.C.® Therapy has the largest body of evidence to date including over 1,000 peer-reviewed articles, 72 of which are randomized controlled trials (RCTs). These studies have demonstrated positive clinical outcomes of NPWT, as well as the effectiveness of V.A.C.® Therapy in diabetic foot wounds, chronic wounds (e.g., pressure ulcers and lower extremity ulcers), and a variety of acute wounds. Some of these studies are listed below. View Abstract on PubMed Randomized control trial 2018 Griffin, et al. View Abstract on PubMed Randomized control trial 2006 Vuerstaek, et al. View Abstract on PubMed Meta analysis of RCTs 2011 Suisa, et al. View Abstract on PubMed Randomized control trial 2010 Dalla, et al.